Camels are among the most amazing animals. They can run at 40 miles per hour in bursts or sustain speeds of 25mph. There are two species of camel, one native to Central Asia with two humps, and the other native to the Middle East and North Africa with a single hump. They store their body fat in their humps, thereby minimizing the insulating effect so that they can survive extreme temperatures. They are highly adapted to withstand hot climates; They have oval shaped red-blood cells, their body temperature changes drastically, their nostrils trap water vapor while they are exhaling, their kidneys and intestines are very efficient at reabsorbing water, and they have an immune system that is different from other mammals. Camels were domesticated at about 3,000 B.C. and there are almost none left in the wild. In the mid 19th century, when the Australian explorers encountered the vast Australian deserts, they hired Afghan cameleers to transport goods throughout the Outback. Today there is an estimated 1 million feral camels in Australia, and they have become somewhat of a nuisance. 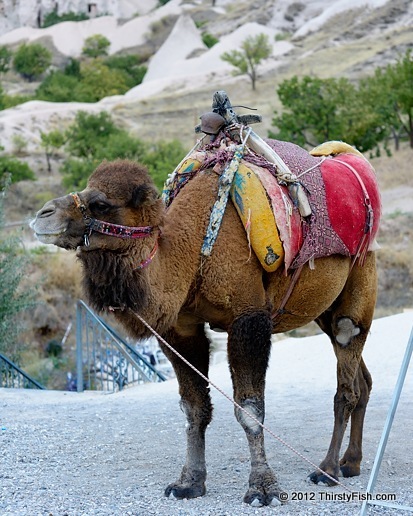 The pictured camel was photographed at Cappadocia.